The Krishna Enchantment Necklace is part of our new Hindu necklace series. Krishna is the Hindu god who enchants everyone with his flute which also symolizes the flow of prana. 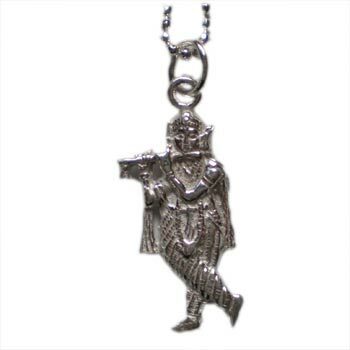 The silver krishna pendant is 1.5" and comes on 16" faceted silver chain. The Krishna Radha Absolute Truth necklace is part of our new Hindu necklace series. Krishna and Radha (his consort) together symbolize absolute truth. The silver pendant is 1.5" (3.5 cm) and comes on 16" (42 cm) faceted silver chain. Ganesh, also known as Ganpati, is the bestower of wisdom and remover of obstacles. 20" Leather Necklace with a silver Ganesha pendant makes perfect ganesh necklace for men or women.